Looking for ways to celebrate National Rural Health Day this year? Here’s a brief glimpse at what some other folks are planning on or around November 16 – and a few additional ideas we came up with ourselves! Do something “healthy” that day – eat more vegetables, bike instead of drive to work, get your blood pressure or cholesterol checked, etc. That is why the National Organization of State Offices of Rural sets aside the third Thursday of every November – November 15, 2018 – to celebrate National Rural Health Day. First and foremost, National Rural Health Day is an opportunity to “Celebrate the Power of Rural” by honoring the selfless, community-minded, “can do” spirit that prevails in rural America. But it also gives us a chance to bring to light the unique healthcare challenges that rural citizens face – and showcase the efforts of rural healthcare providers, State Offices of Rural Health and other rural stakeholders to address those challenges. We know there is work to be done, but we also believe there is plenty to celebrate – and we invite you to join the celebration! The 5th Annual National Rural Health Day was a complete success. Governors Proclamations, Congressional recognition, nationwide events, community engagement, live webcasts and a slew of webinars dominated the day. NOSORH wants to thank the State Offices of Rural Health who planned and celebrated in a myriad of ways and truly showed just what it means to celebrate the power of rural. A special thanks also goes out to the Federal Office of Rural Health Policy for pulling together a broad array of speakers and topics including Acting HHS Deputy Secretary, Dr. Mary Wakefield and Jim Macrae, the Acting Administrator at the Health Resources and Services Administration. Also joining NOSORH from the Administration was Chad Maisel with the White House Rural Caucus. Chad discussed the Integration Models for Parents and Children to Thrive Demonstration project. 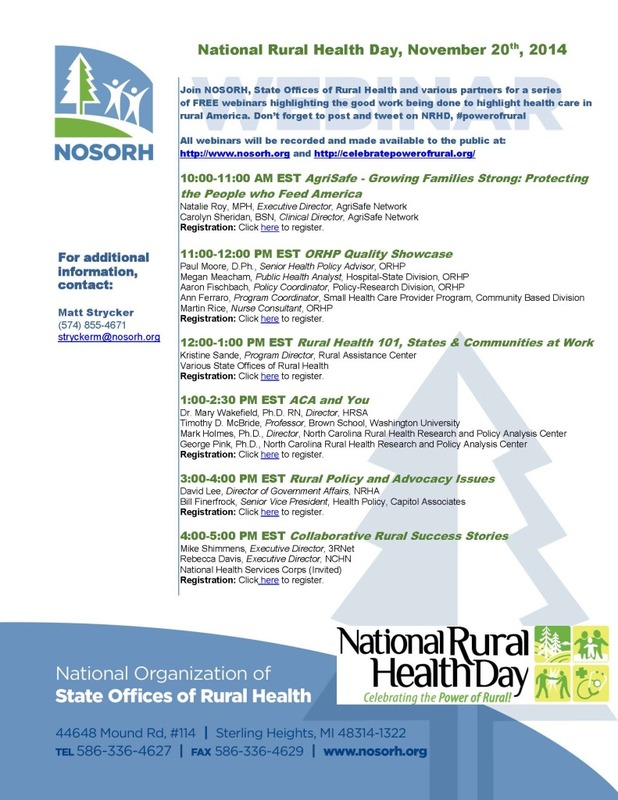 Another thank you goes to our partners – 3RNet, NCHN, and NRHA for collaborating together to make our partners webinar the most attended webinar hosted by NOSORH on National Rural Health Day. Please click here to find all of the presentation and recordings of the webinars. New this year NOSORH compiled a collection of stories from across the nation highlighting providers and communities addressing community health needs in a publication called “Real Doc Hollywoods and Community Stars”, which is published here. SORHs have participated in the success of these stories from conducting the community needs assessment and helping develop programs to promoting the success of the program to other communities. These stories are also great examples of programs that could be replicated across the nation. Remember that State Offices of Rural Health need to fill out the NRHD activities form from this year, please do so by clicking here. The NRHD evaluation will be released soon. Again, NOSORH wants to thank everyone who helped to make this National Rural Health Day the best yet. Listen in as the Rural Assistance Center announces their launch as the Rural Health Information Hub. Speakers will discuss the reasons for the change and what it will mean for users. Join AgriSafe staff to learn how to recognize and respond to emerging issues that impact the health and safety of farm families and access a live and OnDemand webinar training library to increase your professional competency. Join our expert panel for a discussion of changes that are occurring in rural healthcare delivery, how rural facilities can ensure they’re not left behind and what works in rural healthcare. Talk with rural health association leaders and State Offices of Rural Health about partnerships and best practices in relations to Advocacy, Networks, and Workforce. Join Chad Maisel, advisor to the White House Rural Council and leaders from the Federal Office of Rural Health Policy as they discuss child poverty in rural areas and a new program designed to connect families with health and human services. U.S. Department of Health and Human Services Secretary Sylvia M. Burwell will make opening remarks in a discussion of federal investments in rural health and the federal, state and local collaborations initiated by the White House Rural Council. Join leaders of the Veterans Administration and Mercy Hospital in Devils Lake, North Dakota to learn more about collaboration to serve rural veterans. New this year: NOSORH is collecting the “Real Doc Hollywood and Other Healer” stories to honor health professionals who have made a positive impact on their local community, brought services that may not have been there before, has shown local leadership, or has been a dependable partner that has helped make a change for the better. SORHs, please help us identify individuals in your state that have made a difference, so that we may showcase these individuals to promote all of the amazing Real Doc Hollywoods and other Healers around the nation. Please take the time to fill out the form to provide the following information, showing what makes your choice. SORHs may enter as many individuals as they would like, this is not limited to one submission per SORH. NOSORH will work on media stories and a publication to honor their work. To make your submission, click here. NOSORH has already received several submissions. Click here for an example of one of those submissions from the great state of Iowa. SORHs may enter as many individuals as they would like, this is not limited to one submission per SORH. NOSORH will work on media stories and a publication to honor their work. To make your submission, click here. Introducing the new 5th Annual National Rural Health Day logo. We hope you will use this logo to connect with your state partners to promote National Rural Health Day on November 19th. Many thanks to the NOSORH Communications Committee for their input on the design. Help promote NRHD. JPEG versions will be available shortly that can be used in your communications about the day. Post on your social media pages and put in your newsletters. Starting in July, NOSORH will provide regular updates on NRHD. Let Matt Strycker know how you are promoting the upcoming 5th Annual National Rural Health Day in your state. Many thanks to SORHs and partners for making National Rural Health Day (NRHD) a huge success. NOSORH wants to build on this success and asked members to respond to an evaluation survey just before the end of the year. Below are some of the initial results. If you have any additional suggestions, please email Matt Strycker at stryckerm@nosorh.org. NRHD Webinar Flyer – Click here to register!